Olivia Davis is a rarity in automotive art: an abstract artist. Her theme is the objective of every racing driver -- the checkered flag! The creative way she achieves that will make you stop and think. 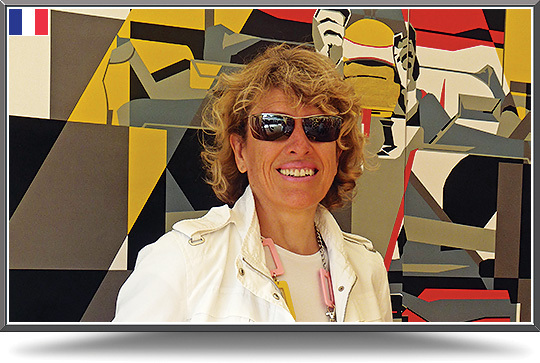 This French-Canadian motorsport artist was born in Paris to a family of industrialists -- her great-grandfather was Auguste Rateau, the turbo compressor pioneer. "Industrial designs have always intrigued me. My grandfather was a car collector and racing enthusiast. Two of my earliest memories are the Eiffel Tower and Quebec Bridge -- icons of engineering! When I look at objects I like to break down the components and retain the essence." Olivia was educated in Canada, England, Switzerland and France. In Paris she studied drawing and painting at the Atelier Farrey Art School and worked with leather, clay, cardboard and textiles at the Centre d’Art et Technique Artisanale. Her work on silk prepared the ground for her perception of the world as blocks of shapes and of colors. Olivia’s silk paintings have been exhibited in the USA, Canada, Mexico and France. She also expanded her appreciation of other media, including pastels which allowed a more flowing and subtle expression, and turned her hand to Interior Design and Public Art. The process of development across all these different media has led to an intriguing blend of subtlety and brashness, exemplified in this collection of paintings in acrylic and mixed media, on canvas. The exciting world of Formula One offers fertile ground for exploring the balance between mechanical shapes and the drivers who set them in motion. The result is a dynamic cocktail of colors and industrial shapes which draws the viewer in: "The application of various images gives my paintings a depth that encourage the observer to think and discover my vision." Commission Olivia to create a unique painting for you!